EkStep Foundation is the technical partner of a new global philanthropic initiative Co-Impact. What exactly is it bringing to the table? On Wednesday, Bill Gates and a group of philanthropists announced the launch of Co-Impact, a collaborative venture which aims to tackle problems in global health, education and economic opportunity. 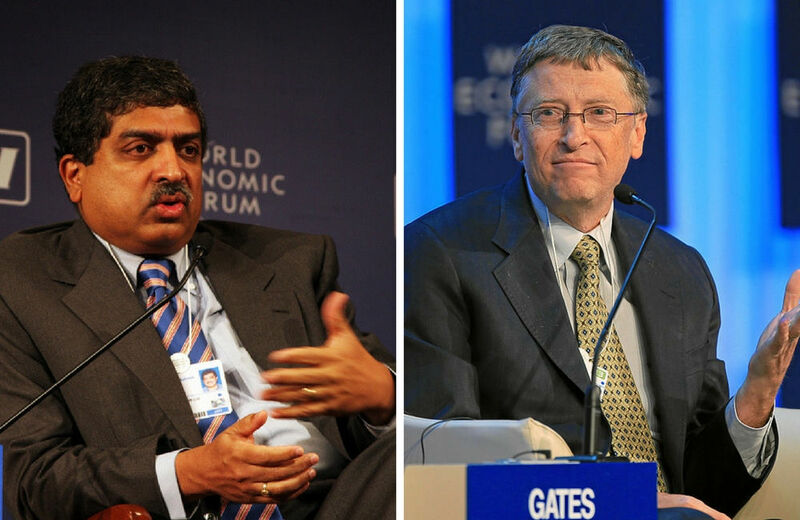 Besides Bill Gates, the group includes Melinda Gates, Richard Chandler, Jeff Skoll, Dr. Romesh and Kathy Wadhwani, and The Rockefeller Foundation. It will invest $500 million in these areas to effect “systems change”. “Systems change succeeds by bringing together local communities, non-profits, governments, business, donors, and others to drive lasting change beyond what any individual actor could possibly do alone,” Co-Impact said in a statement. EkStep Foundation, co-founded by Rohini and Nandan Nilekani, will be Co-Impact’s technical partner and will support programmes with its ‘open knowledge and societal platform assets’, the statement said. What exactly is a societal platform? Why are the philanthropically inclined billionaires interested in it? Why is Nandan Nilekani excited about it? Last month, Charles Assisi and I spoke with Shankar Maruwada, co-founder of EkStep, and a former colleague of Nilekani at the Unique Identification Authority of India UIDAI, and to Sanjay Purohit, founder of ScaleChange, strategic advisor at EkStep and former colleague of Nilekani at Infosys. They have spent months studying, debating and refining the learning from building Aadhaar and EkStep—looking at what worked, what didn’t work and how to make the process repeatable and sustainable. In one of our conversations, Maruwada described their approach as a mix of thinking and doing. “Traditionally, we divide people into thinkers and doers. We do both. We think, we do, and we learn from what we have done, theorise it, and do again, applying what we have learned.” The societal platform approach is a result of this process. Charles and I then discussed this and exchanged notes from the other conversations we have had on related themes. Here is our brief explainer and key takeaways. The need for speed: India is doing poorly in many of its human development metrics, irrespective of whether you look at it through the lens of statistics (India lags behind its peers), expectations (people want development in a much larger measure), pragmatism (inequality and poverty cannot be sustained socially and politically for long) or ethics (“development is freedom”). We can’t ask the people who don’t have access to education, health and finance to wait for another 30 or 40 years. It will be too late. There is a need for speed. The traditional ways of problem solving, by themselves, won’t work. The risk of doing nothing is huge, and unjustifiable. Pipes vs platforms: Traditionally, businesses worked on a pipe model, as Sangeet Pal Chaudhary explained in his books Platform Scale and Platform Revolution. Businesses found problems people faced, solved them, packaged them as products or services and pushed them through pipes to their customers. Businesses produced value at their end, and customers consumed it at the other end. Most businesses work that way—be it a washing machine producer or a university. Government schemes work that way too. Policy makers design solutions, government machinery executes them and citizens consume them. Mid day meals for schoolchildren, for example. Things changed in the digital economy. Chaudhary says the internet led to new platform business models. Here, businesses created platforms that attracted value producers and value consumers. YouTube, for example, is a platform. Producers of video came to the platform to post their work, and consumers came there to see them. Similarly, Wikipedia is a platform. Aadhaar was designed to be a platform too. It’s a platform on which governments could design solutions, and deliver them to people. Now, pipes (or solutions) are limited by an organisation’s resources; they have difficulty in scaling up, because what works in one place, might not work in another. On the other hand, platforms scale fast, accommodating both niche and mass products. On YouTube, I can watch Psy’s Gangnam Style, one of the billion people who watched the video, or listen to a Carnatic song rendered by my niece, one of the seven people who ever viewed it. Because we grew up in a world of pipes, we don’t instinctively get the power and applicability of platforms. Commercial platforms vs societal platforms: Commercial platforms—like YouTube or Uber or Airbnb—of course are there to make money. Their focus is on valuations. They valiantly try to defend their market share. They are constantly worried about revenues. Societal platforms on the other hand differ from commercial platforms in their intent, approach and impact. Ideally, a social platform’s aim is to create social change. They are not restrictive or paranoid, and offer choice. They attract social entrepreneurs. And they measure their impact by social benefits. It’s a story we have heard from development workers and policy makers again and again. You see a problem, think of a solution, execute it, and things seem to change. But sooner than later, things turn as bad as they were or worse. (That’s the cobra effect). The underlying patterns are more powerful than any one-time intervention. Parents who try and clean their teenagers’ rooms know this well too. Systemic change demands that the system is seen as a whole. It demands recognition that a single event can have multiple causes—some of them might relate to the individual, some to institutions, and some to the underlying structures. Solutions that are based on the principle ‘give a man a fish, you feed him for a day; teach him how to fish, you feed him for life’, assume that the problem is with the individual. It doesn’t recognise, or does nothing, to solve the institutional or structural problems. As a result, things really don’t improve. Or they improve too slowly. Both present problems, especially when other sections of the population in whose favour institutions and structures have always worked, progress faster. This in effect means, despite what the data might say, relatively speaking, the poor are becoming worse off. The answer then is not in providing local solutions but in effecting systems change. Societal platform approach: Nilekani and his team use the metaphor of Cambrian radiation to explain their own approach. Cambrian radiation refers to an important phase in the history of our planet, during which most of the diversity that we see today emerged. It was possible because of three primary conditions: There was abundance of oxygen, there was more diversity of habitat, and the atmosphere became more predictable. Similarly, their approach seeks to make resources abundant (which is possible with digital assets); enable diverse innovations by bringing diverse people to solve diverse problems; and leverage existing networks and infrastructure for scale. It is not a demand / supply chain view of platforms (that one sees in the pipes vs platform comparison), Purohit said, but a completely new approach to induce big equilibrium change in a dynamic complex world. It has three layers: The shared digital infrastructure layer at the bottom (which lets you create the digital assets); a co-creation environment on top of it (which brings the community together); and an impact amplification network above it (partners who help the innovation scale fast). To take a familiar example, Unified Payments Interface (UPI) would be the digital infrastructure layer; hackathons and learning sessions that led to the creation of say, PhonePe, would be the co-creation environment, and partnerships with banks would be the impact amplification layer. Purohit and Maruwada said the approach leaned heavily on their learning from building Aadhaar and EkStep. EkStep is a sectoral platform aimed at school children. It has all the three elements. Abundant resources in the form of lesson plans, educational content available for the community. A network of teachers, students, experts building local, customised content / solutions. And a network of partners that includes governments, educational institutions and NGOs. EkStep aims to touch the lives of 200 million schoolchildren by 2020. When Charles and I spoke with Purohit and Maruwada, we didn’t know about Co-Impact, and about EkStep’s partnership with the venture. However, it’s easy to see how it fits into the broader scheme of things. Business leaders once used to restrict their philanthropic activities to giving away money. Now, they actually get onto the ground to design and implement programmes. And they feel the frustration, when the impact of their efforts gets undone by the larger institutional and structural forces. It’s a reason why Azim Premji Foundation started focusing on building and strengthening the existing institutions. When Nilekani and his team set up EkStep, they not only had the experience of building a large-scale platform, they had a deep knowledge of trends in the social sector. Rohini Nilekani had a more direct experience running Arghyam, a foundation that works in the area of water and sanitation. Thus, EkStep drew from Aadhaar’s design principles—platform approach, minimalism, partnerships etc—and learnings from a range of social sector initiatives. The Societal Platform Approach is a codification of the methods, tricks, tools they learned from all these. Our discussions on some elements of IndiaStack, a set of applications being built on the Aadhaar platform, indicate that they don’t suffer from this constraint. Since they were also built on the same design principles, their potential seems a bit clearer. UPI has been adopted by banks and businesses including global players like WhatsApp and Google. In October about 75 million transactions were done on UPI. Still, one can argue that it had the backing of the government. Thus, EkStep, was in some ways, the first real test of the soundness of the principles that were behind the development of Aadhaar. Partnership with Co-Impact will give it a bigger canvas.